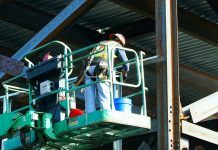 When tight or narrow work shoes are worn, the body reacts to the pressure and friction by trying to protect the skin and the structures beneath it by forming hard and circular areas just like a kernel of corn. The areas can also become inflamed or ulcerated from the constant friction when they rub against each other. Of the two common types the wearing of improper-fitting shoes while working and/or toe deformities causes hard corns. 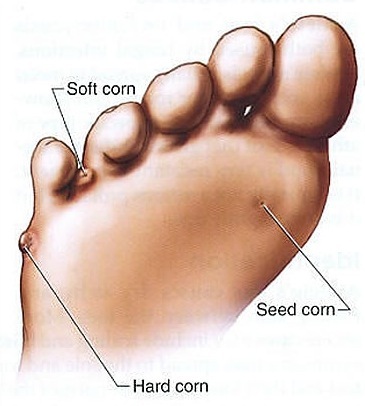 One type usually develops on the tops and tips of the toes and along the sides of the feet; the other type (soft corn) develops between the toes and is sometimes referred to as a “kissing corn,” usually the result of bone abnormalities in the toes. If the toes do not lie flat but curl downward, the toes remain curled inside the shoe, and the tops of the toes press against the inside of the shoe, usually at the toe joints and the tip of the curled toe presses against the sole of the shoe. This causes hard corns or heloma durum. The skin compensates for this added pressure by thickening at the point of contact and hard corns develop to protect the underlying structure. Fitting curled toes into shoes with tight toe boxes is one of the main causes of hard corns. Tight-fitting shoes aggravate soft corns (heloma molle). This type of corn typically develops between the fourth and fifth toes when one of the toe bones is slightly too wide. Normal toes are hourglass-shaped and the tips are wider than the middle. Kissing corns result when the ends of the toe bones are too wide, causing friction in between the toes. People with normal toe bones can also develop soft corns. This is found fairly common in women who wear high-heel shoes. The body is required to shift its weight to the front of the foot, cramming the toes into a narrow, tapering toe box. Hard corns are usually caused by a combination of narrow-toed shoes and toe deformities; they can be treated in either one of two ways. One is to wear wider shoes especially when working. The other is to fix the bone problem in the toes. If the toes are flexible and can be straightened, an orthotic may enable the toe to return to a normal position. Small pads can also be used to straighten the toes. These treatments are seldom a permanent solution. When the toes are not flexible, surgery may be an option. The toe may be held in an abnormal position because the soft tissue around the bones has become stiff. If the soft tissue is released, the toe may straighten. Surgery may seem excessive to relieve the discomfort of corns, but the only other option is to have the corns cut or burned off with a topical acid solution or plaster. This procedure does not always correct the underlying problem, so the corns often recur. Relief of pain caused by soft corns caused by excessively wide toe bones can be as simple as wearing wider shoes with more room between the toes. If this does not eliminate the problem, a surgical procedure performed in the physician or podiatrist’s office may provide relief. If either of these conditions worsen or persist it is wise to see a podiatrist for your foot ailments. Previous articleWhat is Hammer Toe?